Everyone has their way of dealing with what happened. Steve Rogers talks to a support group about his feelings, Natasha Romanoff trains in the red room, uses a shooting range at Avengers HQ to take her anger out. This makes sense for her character because it suggests that she’s struggling just as much as everyone else to cope. War Machine and Ant-Man are the new appearances in the trailer. The pair put their helmets down at the same time, showing unity while also confirming that Ant-Man does join the Avengers. The first trailer ended with Scott Lang tinting up at the Avengers complex, so he most likely is joining them in their mission, whatever it is. Of all the Avengers, Thor’s role in the film is the vaguest in all the marketing footages. We’ve only had a couple of shots of his face. He looks very mopey in these which gives us little concrete information. It’s possible that he found out Thanos’ location or perhaps it’s Wakanda where we see him in the new trailer. It’s also possible that he’s waiting for Valkyrie or looking for the missing Asgardians. We have Clint Barton next who looks more like himself than the Ronin we saw in the first trailer. It’s difficult to say where this shot took place but the red lighting suggests that it isn’t somewhere good. Cap gets his shield back. Not the one was given to him on Wakanda, but the classic Cap shield we last saw at the end of Civil War. It’s cool to see him putting it on, also causing a slight alarm. We can see him visibly shaking as he puts it on. This also indicates he’s suffering from some kind of PTSD. The Super Bowl TV Spot ends with the band very much together, as what’s left of Avengers strides through the Avengers HQ into action. We see Cap, Thor, Bruce Banner, Ant-Man, Black Widow, Rocket and War Machine. That’s the makeup of team you’d expect at this point. This is based on who survived and it’s likely before Tony Stark comes back to Earth. 1. Did they edit a character? There are a couple of moments in the trailer which make it look like Marvel is trying to trick us. 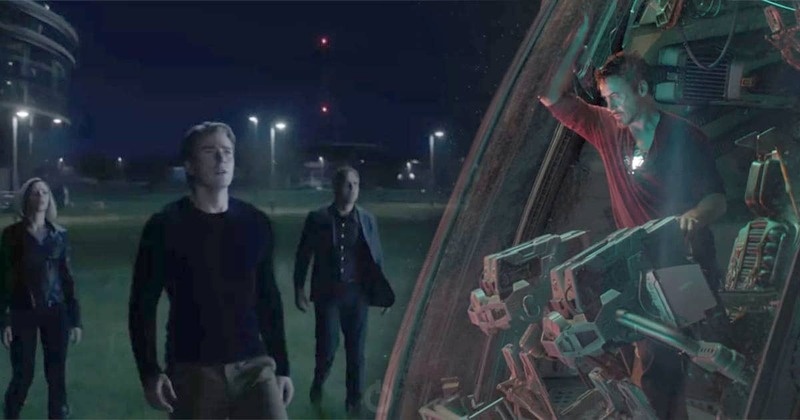 The first comes when Natasha, Steve, Bruce and Rhodes are outside the Avengers HQ at nught, with a gap between Rhodey and Bruce might be where another person has been removed. The second shot comes at the end where we see a sizeable gap between War Machine and Ant-Man.